In India, the western states and certain northern regions have always seen water shortages due to the climatic and geographical conditions. Thus, one can find remnants of many early stepwells in Gujarat, Rajasthan and Delhi. The earliest stepwells were simple in terms of construction; however, over time, more focus was given to its architecture and decoration. They also became places of prayer, sometimes placed near a temple. The local term used for a stepwell varies with each region. 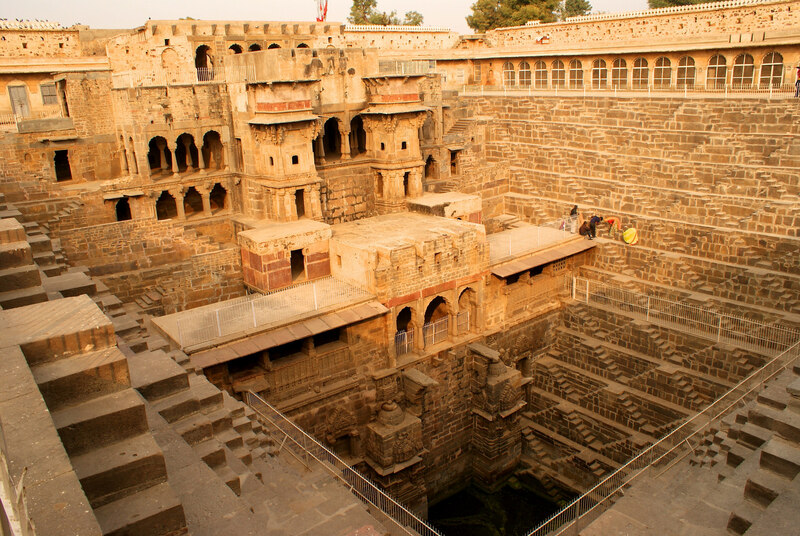 In Hindi, it is called a ‘baori’ or ‘baoli.’ In Gujarati, a stepwell is called a ‘Vav.’ Here, The Culture Trip, shares the best stepwells of India. Rani ki Vav (or Queen’s stepwell) is a UNESCO World Heritage Site situated in Patan, Gujarat. It is believed to be constructed in the memory of King Bhimdev by his widow, Queen Udayamati, around 1050 AD. But the stepwell was flooded by the Saraswati River and only excavated in the late 1980s, by the Archaeological Society of India (ASI). The steps of the stepwell are quite wide and ornately carved with various gods and goddesses. Most of the wall carvings are related to Lord Vishnu, including the Dashavataras (Ten forms of Lord Vishnu). There are carvings of other divine mythical forms like Vishkanyas (women possessing snake-like venom) and Apsaras (celestial women). 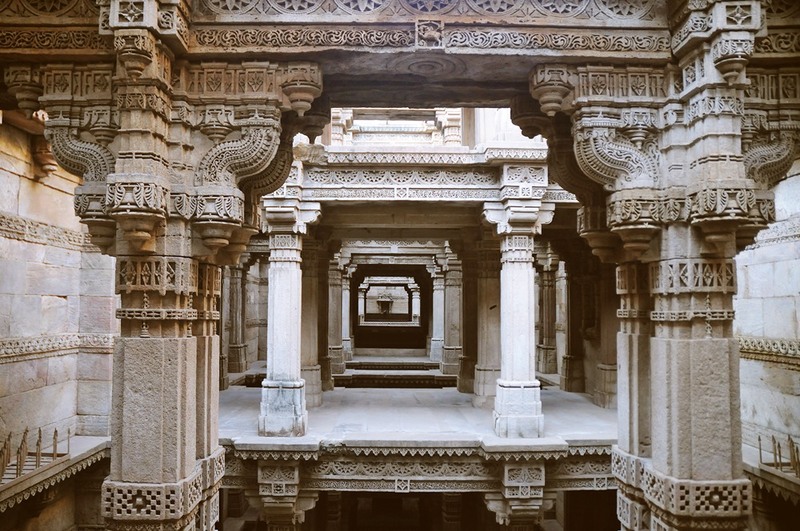 Adalaj ni Vav is another popular stepwell located in Gujarat, approximately 18 kilometers north of Ahmedabad. The walls of the stepwell tell the tragic story behind its existence. The ruler of the area, then known as Dandai Desh, started building the stepwell. But in 1499, a Muslim ruler attacked and ransacked the region, killing the king. The invading Muslim ruler also fell in love with the dead king’s queen. The queen promised to marry him if he promised to finish the stepwell in honor of the dead king. The Muslim invader agreed to build a grand stepwell, with a blend of Islamic architecture and Hindu carvings. But when the well was complete, the queen jumped in and gave up her life. Agrasen ki Baoli is located in New Delhi, close to the Jantar Mantar observatory, near Connaught Place. It is a 60-meter by 15-meter stepwell, with 103 steps. Agrasen ki Baoli has recently been made famous by Aamir Khan’s movie PK. The stepwell is also supposed to be haunted with many people telling stories of feeling a presence in the area. The fact that numerous bats reside in the area also adds to the eeriness of the location. Chand Baori is one of the most visually spectacular stepwells and probably one of the largest. It is located around 90 kilometers from Jaipur (Rajasthan), in the village of Abhaneri. It was built by King Chanda of the Nikumbha Dynasty, between 800 and 900 AD. The stepwell is over 13 stories deep with 3500 steps and built opposite the Harshat Mata temple. Pushkarini literally translates to a temple tank. The Pushkarini is located near Mahanavami Dibba in the Royal Center of Hampi, Karnataka. The unique feature of the stepwell is that the water in it was filled by aqueducts, very similar to the ones used by the Romans. The Pushkarini is perfectly geometrical, devoid of any elaborate carvings. Archeologists found pieces of it and then restored it by piecing the stepwell back together. The Modhera Sun Temple is a unique temple in Gujarat dedicated to the Sun God. 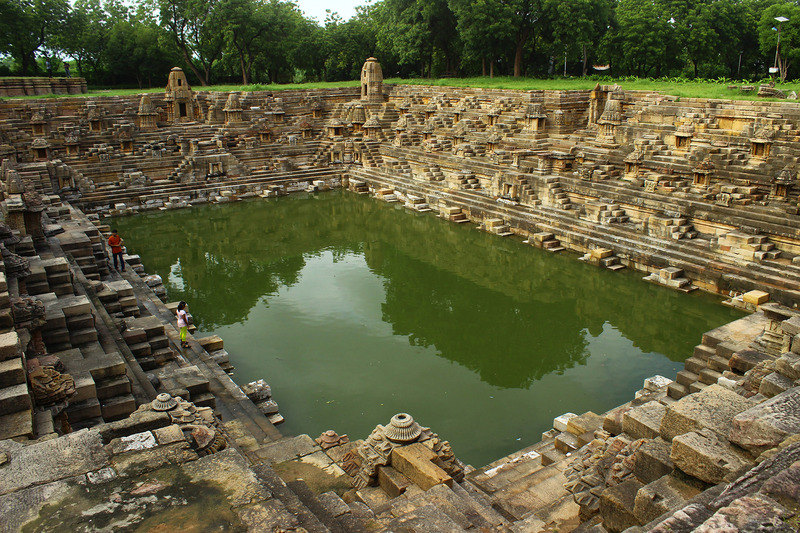 Right opposite the temple is a huge stepwell called the Surya Kund (stepwell dedicated to the Sun God). 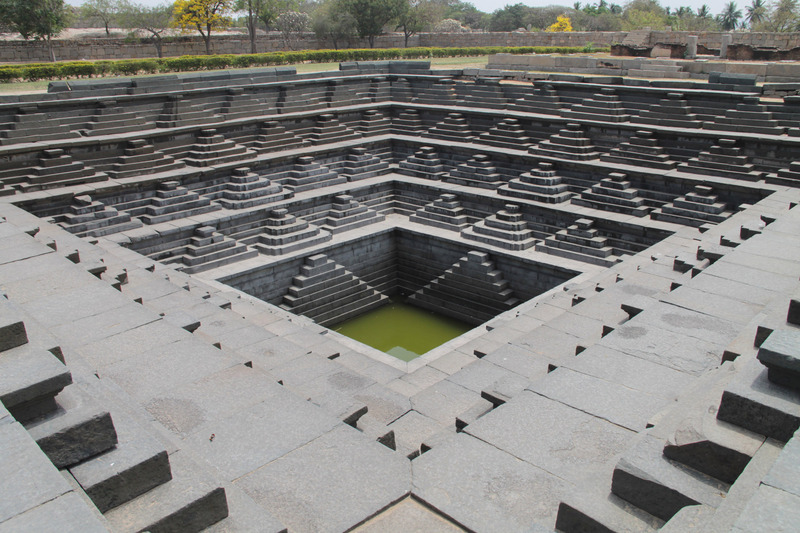 It depicts the usage of a stepwell for more than just water storage. It was used for religious ablutions before praying to the Sun God. The stepwell is not too deep but quite wide and consists of 108 miniature shrines carved on the steps. The number ‘108’ is considered an auspicious one for the Hindus. 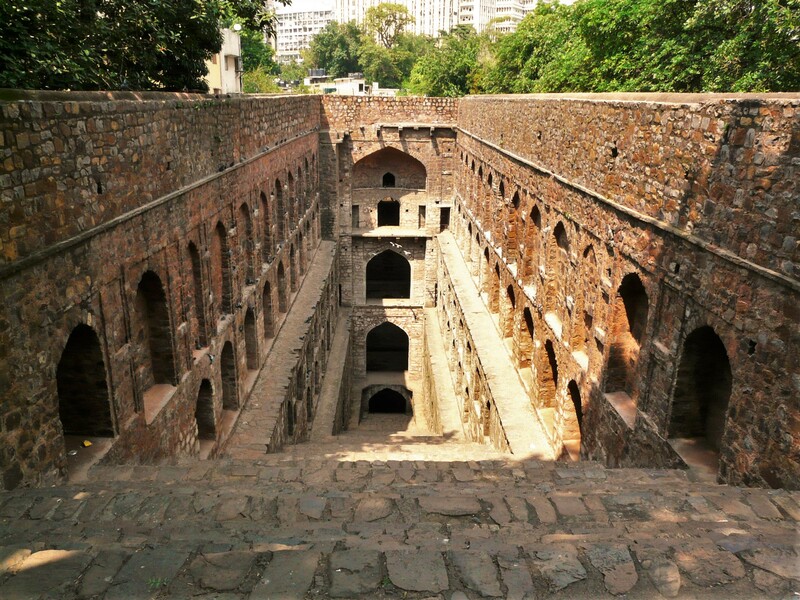 Situated in the Mehrauli Archaeological Park in New Delhi, the Rajon ki Baoli is more proof of the erratic monsoons and need for water conservation in Northern India during medieval times. 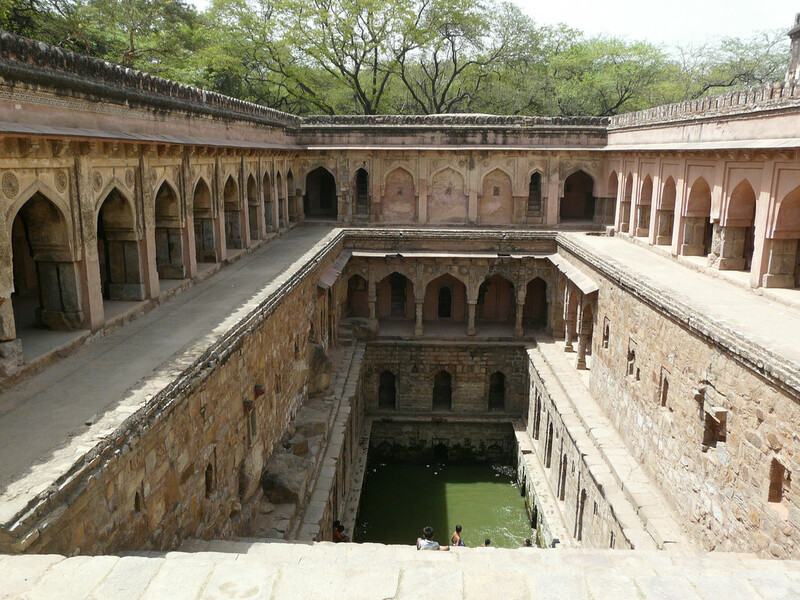 The name Rajon ki Baoli is believed to be not after Kings (Raja) but masons. Why it was named after masons is not yet truly known, though there are many stories. Supposedly built in 1516 by Daulat Khan and restored in the early 2000s, the stepwell is a grand structure both in terms of scale and architecture. There is a small mosque built right next to it. Rani ji ki Baori also means ‘Queen’s Stepwell,’ similar to ‘Rani ki Vav.’ This stepwell is located in Bundi, Rajasthan. It was named so probably because it was constructed under Queen Nathavati in 1699 AD. Bundi is also popularly known as the city of stepwells, which goes to show the importance of these tanks for water conservation in the arid region of Rajasthan. There are supposed to be around 50 tanks or Baoris in Bundi. Queen Nathwati herself is credited with building 21 of those tanks.